This is an unproofed off-the-cuff post! If it’s interesting, please back my Patreon for more. Here’s a consolidation of them with some better explanations. EP2 has two types of tables; inline tables and floating tables. Roughly, the inline tables are “stuff characters have” and the floating tables are “stuff characters or players do.” I may talk about the inline tables later, but for now I’m going to talk about the floating tables—that’s the Random Career table you see above. 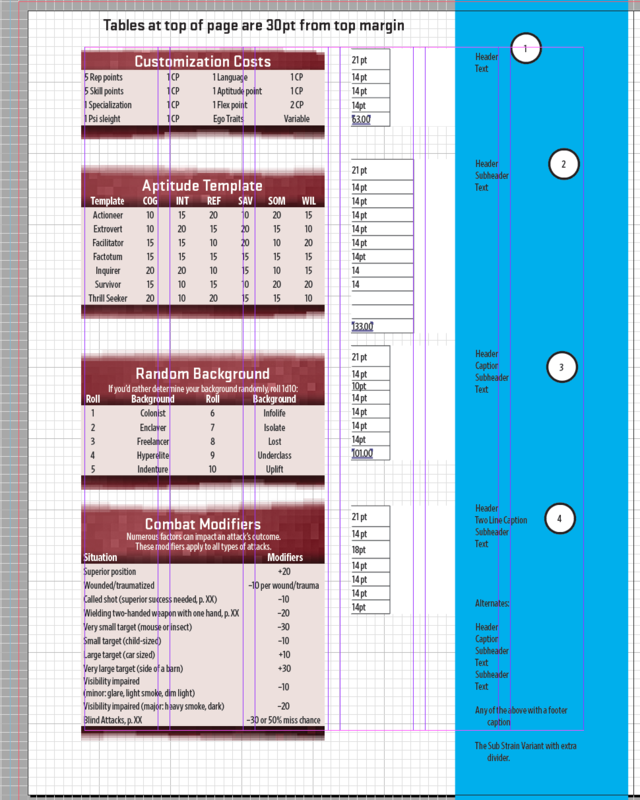 EP2 has a roughly six-column-wide grid. Floating tables can be 2 columns, 3 columns, 4 columns, or 6 columns, depending on the need of the tables and the need of the spread they’re on. I have yet to need to Break The Rules on these tables, but the book isn’t finished! Sub-strain headers, which currently have a little extra graphical divider because they’re kind of a an-extra-special-case table. If you take a closer look at Tables 1, you’ll see that on the right of each table I have the point height of each cell listed. Most of the cells are 14pt high, but a few of them — the prefix line and the dual prefix line — are slightly smaller, to help keep text in proper proximity to related text. The main difference for these tables, for the purposes of graphics, are the height of the graphics and the placement of the small shadow effect. Originally the shadow was a distinct graphic placed inside a row in the table, but that didn’t quite create the effect I wanted; I need the shadow to help normalize the contract on the subheader text. So, Tables 2 shows the list of graphics I’m working with. “Table texture base – derezzed.psd” is my main work file. It’s placed as a smart object with a mask inside the other listed graphics, and each of those graphics has a distinct layer for the shadow, aligned according to the numbers in the Tables 1 graphic. The filnames have the number of points from the top of the graphic to the bottom of the shadow, and a single digit (1 through 5 skipping 2 because I didn’t need it … yet?) indicating which one is tallest, so I can sort them by name and not lose track of which one is which. 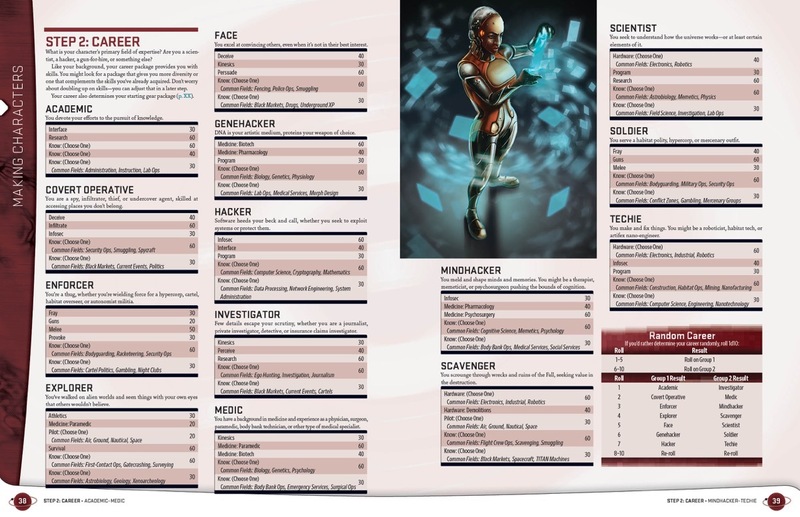 Truth be told: I don’t know if these are 100% the final graphics … but with this system, I can update all of the table graphics across the book with just a few Photoshop edits, and I know the math will work out. A million years ago, I cooked up an InDesign PDF Export Preset to handle exporting PDFs that worked well on the then-brand-new iPad while maintaining relatively small file sizes. I still use that preset basically every day, having published dozens of books with it. You can download it here. Adobe has instructions for loading PDF presets. This preset turns all the Layers in your InDesign document into Acrobat layers; so users can hide backgrounds, art boxes, etc. (depending on how you use Layers in InDesign, of course.) You can untick this if you don’t want layered documents. “Embed Page Thumbnails” is disabled because the thumbnails that InDesign creates are lower quality than the ones than Acrobat creates on the fly the first time it loads a PDF. You can safely change the PPI and Image Quality in the Compression tab. There are no security settings set, because I want my customers to be able to hack the documents they buy, and PDF security is trivially cracked. If you have any comments or questions, drop me a line!